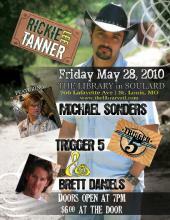 We’re playing this Friday, 5/28 at The Library in Soulard with Rickie Lee Tanner and Michael Sonders. All country bands. All talented. Don’t miss this show! Doors at 7PM. $6 cover. Come on out and support local country music.